In December of 2016, Ms. Yvonne Murray was found unresponsive in her home due to a drop in blood sugar. 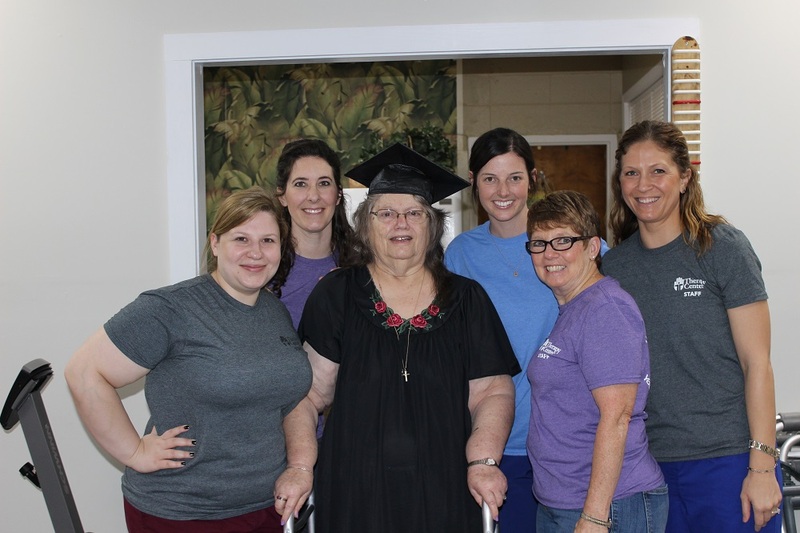 After a stay at the Rehabilitation Hospital of Jennings, she was admitted to Jeff Davis Living Center for ongoing speech, occupational, and physical therapy. Her goal was to return home, so Yvonne’s family chose for her to receive rehabilitation services at Jeff Davis Living Center. “When I first met Ms. Yvonne, she needed lots of cueing and required a significant amount of time to process simple tasks,” stated Audie, speech therapist. Audie continued to work with Ms. Yvonne on home management tasks, including medication and money management. Within a month, Therapy Center’s team of therapists saw significant improvement in her outlook and progression. “Ms. Yvonne was not motivated at first, but after seeing that she could accomplish tasks given, she became encouraged and advanced quickly. Her endurance on the exercise bike went from less than a minute to now more than fifteen minutes. ” explained Rebecca, Certified Occupational Therapy Assistant. “During her treatments, Ms. Yvonne demonstrated significant progress in therapy by tripling her distance with walking,” remarked Sadie, PTA. Ms. Yvonne has since returned home from Jeff Davis Living Center and is back to her life, cooking and enjoying time with her family. For more stories like this, visit the success story section of our blog! Looking to make a difference in the geriatric population, learn how you can join our team by reviewing our current job openings.